No trip to Bali is complete without a little real-estate lust: the only thing better than being in paradise is owning a piece of it yourself to return to when times get a little too real. 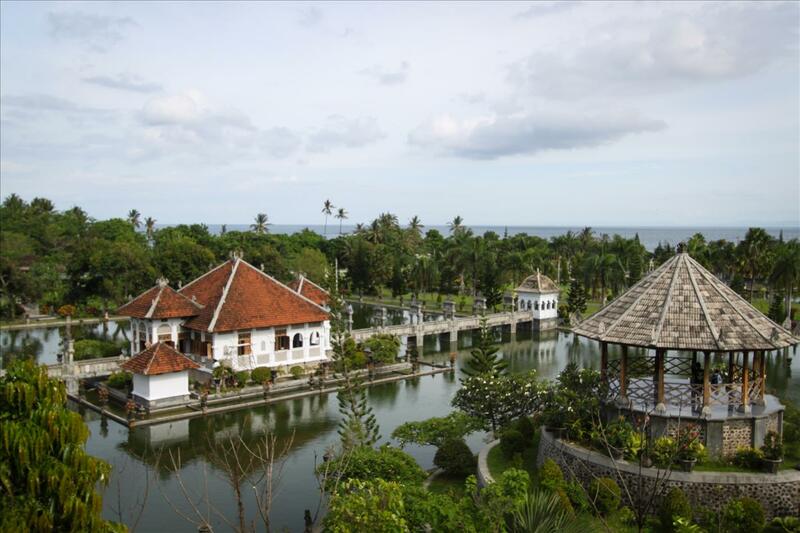 This brought us to the Taman Ujung Water Palace, if you’re going to dream, might as well dream big, right? We crossed a bridge over a moat to get to the entrance of the palace. There was nothing about that that I didn’t love. A whole moat separating your driveway from your front door would eliminate a hell of a lot of solicitation visits and give you a lot of time to remember if you left something plugged in or not. It would however make you think twice about leaving somewhere having to pee even a little. So the next security feature of this house is…another moat. You can either row a boat across or take one of two side bridges to make a house call. Feel free to stop on by anytime, really! More security features include Hindu stone demons, sure to scare off pesky children from fishing or bathing in your moat, trick-or-treating, selling candy, or committing general acts of mischief. 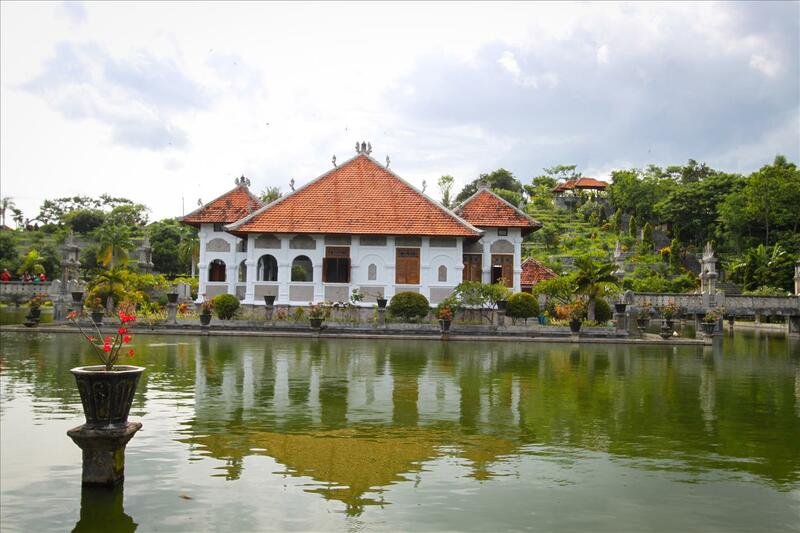 The palace was built 1909 as a relaxation and recreation palace by the King of Karangasem, I Gusti Bagus Jelantik. 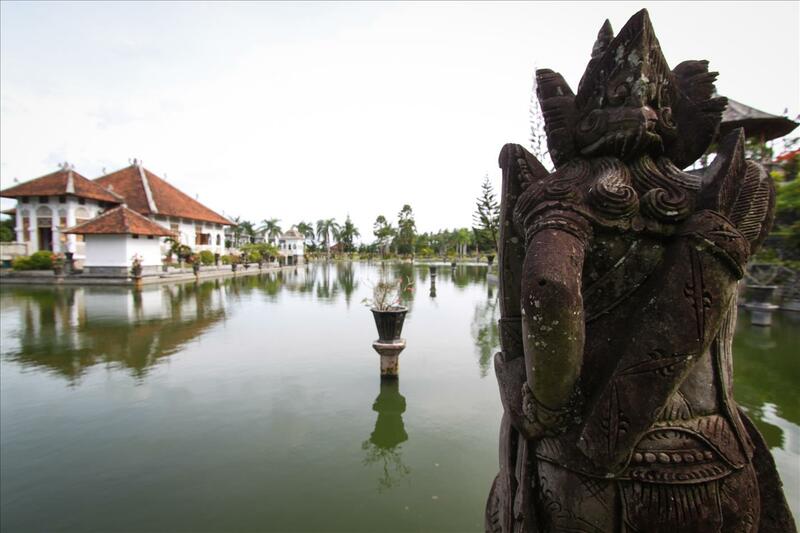 It was almost completely destroyed by the eruption of Mount Agung 1963, but renovated by the Dutch before being damaged again by an earthquake in 1979. So it’s a bit of a fixer-upper. From the interior of the main palace beautiful views of the water and gardens can be had, step outside on the many arched bridge and enjoy the rippling water and meandering fish below. In the rear of the palace gardens there are fashionable ruins of the over 100 year old original building. It serves as a great spot to imagine that you’re in Ancient Greece, flip open a philosophy book and contemplate reality like you’re in a different time. Or enjoy the panoramic view to observe and admire your palace grounds. In every detail of the palace you can find something new and interesting to look at: one way to never get bored and pass the time in your solitude. Enjoy a picnic in your garden gazebo when you want to ignite some romance. You know what I’m talking about: gazebos equal romance. So you can come visit us at our new palace. It was a bit of an upgrade from my Malang Studio, but you know, we’re coping with the change. Okay, okay so it’s a national historical landmark and cultural site and totally not for sale. But a girl can dream of being a princess, and give herself a fantasy real-estate tour once in a while. I loved this! I used to have those same fantasies at the Huntington Library! Huntington Library…. I remember when you took us there. I remember when we went for the stinky flower….guess what? That flower is the national flower of Indonesia and grows on one of the islands here!